The gauge indicates the approximatequantity of fuel remaining in the tankwhen the “IG−ON” mode is enabled. It is a good idea to keep the tank over1/4 full. When you refuel on a slope, the indicatormay not show the correct level. When you refuel less than about 11.4 L(3.0 gal., 2.5 lmp.gal. ), the fuel indicatormay not change. After the 12 volt battery is reconnected,one segment will flash for a while. If the fuel gauge display flashes, theremay be a problem in the system. In thiscase, contact your Toyota dealer as soonas possible. 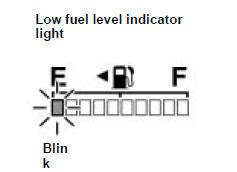 If the fuel level approaches “E” or the lowfuel level indicator light blinks, fill the fueltank as soon as possible. At the first blinking of the light, the masterwarning light in the instrument clustercomes on and the message appears onthe multi−information display to remind thedriver to fill fuel. On inclines or curves, due to the movementof fuel in the tank, the low fuel levelindicator light may come on earlier thanusual.